Swap out your overheated factory top mount intercooler for the PERRIN Front Mount Intercooler to get the most out of your turbocharged STI. Add power and a new bold look all in one. This dyno graph was pulled from the testing we did comparing the OEM Top Mounted Intercooler and the PERRIN Front Mount Intercooler. We had the car all set so we could do these tests back to back with only a couple minutes between runs. The test compares the small stock TMIC to the huge PERRIN FMIC, and you can see there is 10-18WHP and 10-15ft-lbs of torque gain! Part of the reason for the gain is that the intercooler is less restrictive and also cools the charge air better. In this case, the PERRIN FMIC knocked off about 40F from the intake charge temperatures! Our intercooler support beam is constructed from boxed steel and powder coated black. Competitors use inexpensive aluminum bumper beams which save a little weight but are easily destroyed in a collision. The most important part of any intercooler system is the core. The core cools the charged air on the way to the engine. 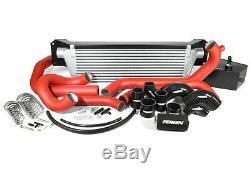 The factory tube and fin intercooler was designed to be easy to manufacture, but is not good for performance. Our testing has shown the optimum core design is the 3/8 bar and plate style that has a 3/8 charge air and ambient air path, instead of the common 1/4 size. The PERRIN bar and plate core design is much more durable than tube and fin with the ability to withstand rocks and other debris, which may enter the scoop. The PERRIN intercooler core is 28 long x 9.25 tall x 3.5 deep with a volume of 906.5 cu-in. Giving the PERRIN Intercooler the best overall design for cooling and pressure drop! Every PERRIN intercooler is powder coated to further protect your intercooler from the elements making it look awesome for years to come. Our intercoolers come in two finish options, a bright silver or stealth black powder coat. The PERRIN designed end tanks control for near perfect dispersal of hot air across the intercooler core. By eliminating any 90º corners adding a smooth, and gradual taper from top to bottom turbulence is eliminated. Each end tank incorporates an innovative mounting tab to secure the core to the mounting beam. PERRIN boost tubes are CNC mandrel bent from aluminum tubing for better weight reduction. Every boost tube has an over sized beaded end to ensure the hose clamps and couplers stay connected and sealed! We choose to take the smoothest shortest path to get air to and from the intercooler. Right off the turbo a smooth offset coupler carries the hot side air charge to a perfectly matched 2.25 boost tube. We chose 2.25 tubing for a smoother, cleaner, obstruction free routing while still being large enough to flow more WHP than most turbos can put out. The air charge then is routed through the engine bay next to the battery, and down behind the radiator to the intercooler. The cold side boost tubes are mounted as high as possible in the engine compartment to clear all turbo and intake combinations as it travels to the throttle body through the engine bay. The clamps included with the PERRIN FMIC are standard on all PERRIN intercooler kits. They are designed for uniform clamping at all points around the band. Never worry about having to re-tighten down the road, plus each PERRIN clamp is made in the USA and has the torque spec engraved on each one. The PERRIN Front Mount Intercooler kit includes a PERRIN Washer Fluid Tank. How the boost tubes are routed through to the intercooler, the OEM tank conflicts with the space required. The PERRIN Washer Fluid Tank is protected from the elements by a black powder coating finish. It looks great and makes the silk screened logo pop. The PERRIN Front Mount Intercooler kit includes a PERRIN Coolant Overflow Tank. It adds clearance for better boost tube routing, holds more coolant than previous designs and uses the OEM tank cap for a great seal! The PERRIN Coolant Overflow Tank is protected from the elements by a black texture powder coating. PERRIN is one of the only intercooler manufactures who pressure tests every intercooler. We pressurize every intercooler to 50 psi. This ensures you never get a core with a leak! Even the slightest leak can cause your vehicle to lose power, literally bleeding turbo boost pressure out the intercooler. The PERRIN Front Mount Intercooler kit only adds 9lbs of weight! If you take all the factory pieces you remove and compare them to the PERRIN parts you are installing, you will find you only added 9lbs! Included with our front mount intercooler is a free PERRIN logged intercooler stencil. 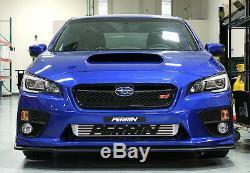 Use the stencil to easily paint the PERRIN logo across the front of your intercooler. Simply peel, stick, paint, and remove. The item "Perrin Front Mount Intercooler 2015-2017 STi Silver Core withRed Piping" is in sale since Thursday, September 8, 2016. This item is in the category "eBay Motors\Parts & Accessories\Car & Truck Parts\Turbos, Nitrous, Superchargers\Turbo Chargers & Parts". The seller is "massautowerks" and is located in Pawtucket, Rhode Island. This item can be shipped to United States, Canada, United Kingdom, Denmark, Romania, Slovakia, Bulgaria, Czech republic, Finland, Hungary, Latvia, Lithuania, Malta, Estonia, Australia, Greece, Portugal, Cyprus, Slovenia, Japan, Sweden, South Korea, South africa, Thailand, Belgium, France, Hong Kong, Ireland, Netherlands, Poland, Spain, Italy, Germany, Austria, Israel, Mexico, New Zealand, Singapore, Switzerland, Norway, Saudi arabia, United arab emirates, Qatar, Kuwait, Bahrain, Croatia, Malaysia, Brazil, Colombia, Panama, Bahamas, Viet nam. California Prop 65 Warning: WARNING: This product can expose you to chemicals which in the State of California can cause cancer and birth defects or other reproductive harm.There are over 800 chemicals on the Proposition 65 list, which is administered by California's Office of Environmental Health Hazard Assessment (OEHHA), a part of the California Environmental Protection Agency. The list includes naturally occurring and man-made chemicals. Proposition 65 warnings can be seen for a wide variety of everyday consumer products, including Automotive Performance products and warnings can be seen posted throughout California in a automobile dealerships/repair shops, and retail stores just to name a few. To comply with the requirements of Proposition 65, the following warning will be put on every product sold by us.